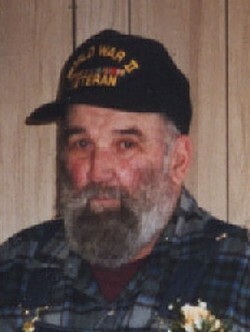 Howard Andrews age 87, of Center Junction died Friday, April 30, 2010 at the Monticello Nursing and Rehabilitation Center. Funeral Services were held at 10:00 Monday, May 3 at the First Presbyterian Church, Monticello with interment in the Amber Cemetery with military honors. Friends called from 2 until 6 Sunday at the Goettsch Funeral Home, Monticello. Rev. Penny Thompson officiated at the services. Surviving are his wife, Roberta, four children, H. Phil (Joy) Andrews, Anamosa, Dale (Lois) Andrews and Evelyn (Thomas) Stoll, both of Cascade, Rex (Diane) Andrews, Center Junction, ten grandchildren, Scott Andrews, Kris (Dave) Martin, Travis (Katie) Andrews, Thomas, Timothy Andrews, Sara (Michael) Rubocki, Douglas (Amanda) Stoll, Andrew Stoll, Dawn and Jason Andrews, two great-grandchildren, Brynn and Reese Martin, a sister-in-law, Vera Mae Moran, Center Junction, and a nephew, Michael Moran, Colorado. He was preceded in death by his parents, and a brother-in-law, Louis Moran. Howard Phillip Andrews, Sr., was born July 16, 1922 at the Anamosa Hospital. He was the son of George and Ella (Bailey) Andrews. Howard attended the Anamosa Community Schools and graduated from Center Junction High School in 1940. Howard enlisted in the U. S. Army Air Corps on December 27, 1942 at Camp Dodge. He completed aerial gunnery school at Wendover Field in Utah and was deployed to the European Theater. He was an airplane and engine mechanic in England, Normandy, Northern France and the Rhineland. He was honorably discharged from service on December 31, 1945. He returned home where he married his wife Roberta Johnson on November 23, 1948 at the First Presbyterian Church, Iowa City. The couple farmed in Jones County and in 1971 purchased Andy's Pub in Center Junction and operated it for five years. Howard was a member of the Center Junction Presbyterian Church. He also belonged to the VFW Post 4077, the Arthur McCullough American Legion Post #13 and the Am Vets Post #110 all in Anamosa. He served on the Amber Cemetery Board for over forty years. He was a founding member of the Twin Rivers Pheasants Forever and the Pioneer Cemetery Association. Howard loved the outdoors, hunting, fishing, gardening. He also collected knives and guns and was a die-hard St Louis Cardinals Fan. He always enjoyed a good card game and was an avid euchre player.